Defined, chocolate is ground cacao seeds that have been fermented, roasted and shelled, and which have been added with a flavoring agent or a sweetener. Chocolate is also the term for the beverage created by mixing milk or water with chocolate. Cocoa beans, what chocolate is made from, contains about 50 percent fat. This fat content is primarily composed of stearic acid, palmitic acid (both saturated fats) and oleic acid (monounsaturated fat). 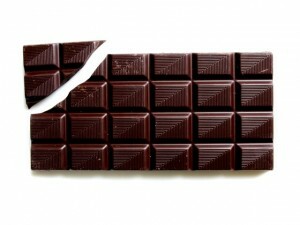 It is important to take note that cocoa butter and chocolate alone do not raise blood cholesterol levels. It is when milk or other types of fat are added to chocolate that it becomes instrumental in raising blood cholesterol levels. Cocoa beans contain a significant amount of dietary fiber (soluble and insoluble) and starch. It also contains a very little amount of simple sugars. However, the chocolate’s sugar content is increased because sugar is added during its manufacturing process. Cocoa beans have polyphenols or flavonoids that are known to have antioxidant properties. These polyphenols are composed of catechins, procyandins and epicatechins. These flavonoids are stored in the non-fatty parts of the cocoa beans. Part of the functions of flavonoids is reduce blood clotting, thus help in reducing the risk of heart attacks or strokes. Other nutrients found in cocoa beans and chocolate include theobromine (helps increase urine production), caffeine, phenylethylamine, serotonin, magnesium, iron, copper, manganese, calcium, zinc, potassium, vitamins A, B2, C, B1, B3 and pantothenic acid. There are several types of chocolates that are available in the market. Unsweetened chocolate refers to pure chocolate. It is also called bitter chocolate or baking chocolate. Bittersweet, sweet or semi-sweet chocolates are those that have been added with sugar, vanilla or lecithin. Milk chocolate is chocolate that has been added with dry milk. White chocolate is actually not chocolate as it does not have any chocolate in it. What white chocolate does have is sugar, milk solids, vanilla, cocoa butter and lecithin. Aesthetically, overindulgence in chocolate has proven to be fattening. Regardless of the type of chocolate eaten, these sweet treats all contribute to weight gain, as it contains a large amount of sugar and fat. Weight gain almost always leads to diabetes, if uncontrolled. Complications of diabetes include heart diseases. These are just possibilities when a person constantly eats a lot of chocolate. However, it cannot be denied that chocolate does have health benefits when eaten in moderation.